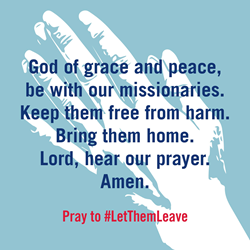 The Council of Bishops of The United Methodist Church is calling for the immediate release of missionaries being held by the Republic of the Philippines and has launched a worldwide #LetThemLeave campaign against treatment of the three young adults who have been denied permission to leave the country. United Methodist leaders call for missionaries to be released. We are respectfully asking that these young people be allowed to leave. The Council of Bishops called upon United Methodists to pray daily at noon, wherever they are, for the three missionaries for as long as the three are held. United Methodist leaders also have launched a worldwide #LetThemLeave campaign against the mistreatment of these three missionaries in the Philippines. The General Board of Global Ministries is the worldwide mission agency of The United Methodist Church. Founded in New York City in 1819, Global Ministries today supports more than 300 missionaries in 60 countries, including the United States. It has personnel, projects and partners in a total of 136 countries. Learn more about Global Ministries by visiting http://www.UMCmission.org or follow http://www.facebook.com/GlobalMinistries and http://www.Twitter.com/UMCmission.